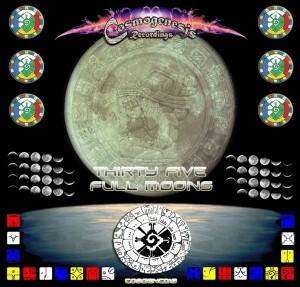 The Cosmogenesis Recordings sound is defined by an upbeat mixture of blasting full-on psytrance with “serious high vibe ‘avin it energy.” Their thirteenth release is 35 Full Moons, another edition of their flagship compilation series–a sonic countdown to 2012. Expect to hear strong melodies and ecstatic atmospheres layered over pounding beats designed to lift your spirits and heighten your perspective! MP3 Download | FLAC Download | WAV Download · Download count: 13,361. Released under a Creative Commons licence for noncommercial usage. Visit the Cosmogenesis Recordings discography for more free releases or check out Jamvana and search for “Hybrid Killers” to have a taste of their new commercial offerings! I love Cosmogenesis Recordings and their fullmoon compilations! I will play some tracks from this compilation 4th day of E-Tvrdjava festival. To all people downloading this album. The mp3 download is incorrect as the last track by myself is missing the end of the track as the real length of it is 7m 37s PLEASE CAN YOU REUPLOAD THEM CORRECT Basilisk. Sorry but will sort out soon the error soon folks! Sorry about the error but will be corrected as soon as possible folks! ene buur tsomog namaig yag allaaa buddha min galzu ruulj bn hehe ta buhend amjilt uragsha zaluusa. The FLAC version has some weird error with Track 10 too…when attempting to burn it…. Basilisk is updating the file error this week sometime! Their was an error with the upload from me to him in Filezilla ftp uploads. The sample used in track “Manga” by TighT is actually the intro of a tune originally coming from the game “Break Quest” by Nurium (music by Maniacs of Noise). fantastic tracks!! !good work kristian keep it up!!! !